Cats Claws Feline Flyer Attachment for Cats Claws Wands. Simply snap the chain connector onto your wand and you can provide your cat with a new toy in seconds. Try all Cat Claws Attachments. Assorted Colors. My cats will jump and chase this toy until they drop from exhaustion. Hands down the favorite toy for our cats! The spinning/flipping motion resembles a bird and they love it. They'll run, jump and do back flips for these toys. Just buy a few at a time. Cats love them so much they chew them up in no time. My kitties favorite toy! ! ProsShape allows for awesome fluttering bird-like movement in the air that my cats go nuts for. These replacement feathers are impossible to buy where I live and they're one of the cat's favorite toys. The seller offered a great deal and extremely fast shipping. I'd happily buy from this company again. Thanks! A couple of my cats started going after the feathers while they were still in the bag so although they loved the tassels, they insisted we put the feathers on the want. Now this is the greatest toy ever according to my cats. Everyone loves it and fights to be the one doing the flying leaps thru the air. Unfortunately, only after a week or so, one of the feathers has come out and won't stay in for long when reattached. ConsFeathers don't stay in place for long. Feathers came as advertised. Different colors, keychain snap hookup as I needed. First one flew with pizazz, ripples through the air with a sound that attracts the cats to come and play. Worth the price any day of the week. my kitten loves to jump and chase as is typical. This is the best cat toy ever created! It brings out all the feral hunting instincts in cats, giving profound mental and physical stimulation. 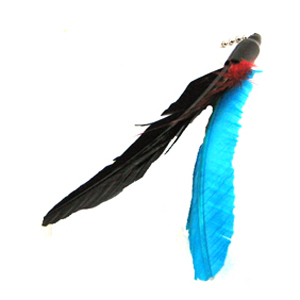 ConsThe attachment point between feathers and chain is a bit heavy, and can upset the cat if they collide with that part.